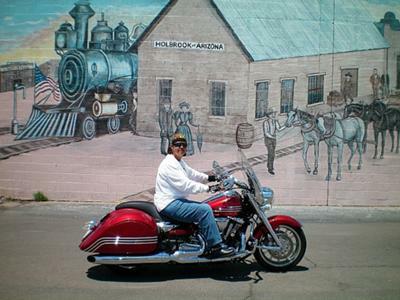 I ride a 2007 Yamaha Roadliner (1900cc's)(Big Red). This is my 4th (and last) bike. I'm a huge fan of STAR motorcycles. By far, this has been the easiest to handle and the most comfortable to ride. I've got it decked out with Corbin Bags (which do wonderful for the long rides across state lines. I've got Lindby bars, Corbin Stinger (custom designed) seat, a modified windshield (with my nickname etched on it), custom derby cover, Roadhouse pipes, red LED lights to show off the chrome. I want to deck it out so anyone who knows me, sees it and knows it mine. I live in Arizona where I can ride all year round, and have ridden to Tx (not on this bike though) to San Diego (never again)and Las Vegas and around the state. The next big ride is Colorado, but we're still working that out. I love riding. It's the only time I can be by myself with my own thoughts. I now have speakers (formerly used an IPOD) and it's an even better experience. ...I rode one from 2006-2011 and I still miss it! Great bike! 42000 miles on her by the time I traded her in, but I just had too many bikes for the time I have to ride. This working for a living gets in the way of my riding! I have a VStar 650 Custom. I too love Star Motorcycles. I am so comfortable on mine and it has a lot of get up and go. They are great bikes. I recently found this site and it has a lot of information for women. I love it. Beautiful bike!! The name fits it perfectly. I too love the Star bikes. I upgraded to the 1100 VStar in November and have never regretted it. So nice for cruising on long rides. My fiance rides the RSTD which is a dream. Enjoy! Wow..this site is so awesome...I don't know anything about bikes and reading your stories is giving me an education as well as inspiration...your bike is beautiful! Be safe and have FUN! The bike is beautiful, enjoy and be safe! WOW WHAT A BEAUTIFUL BIKE! ENJOY! !